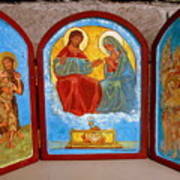 There are no comments for Saint Francis Tryptich Opened. Click here to post the first comment. 53. 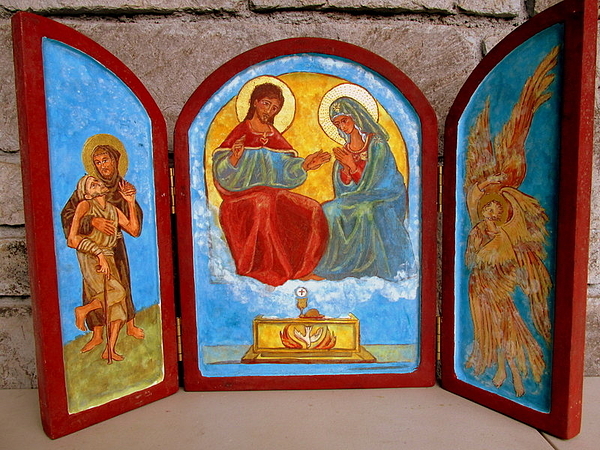 SAINT FRANCIS TRYPTICH egg tempera on gessoed wood. Saint Francis brings Leper to Jesus and Mary, seated on throne in heaven. The archangel who appeared to Francis is on the right. In the center is the communion altar. 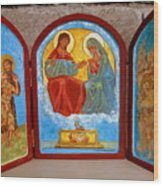 This center image is portrayed in Assisi in the church where Francis died.